Actual colours of pads may differ from those shown. Colour coded: white (oil only), grey (general purpose), yellow (hazchem). Available in 100 & 200 pad bales and rolls. We have a range of 15 polypropylene products available to suit your specific requirements. NEW AUSTRALIAN MADE - Oil only pads available. These pads are reusable up to 50 times and measure in at 52 x 45 cm. 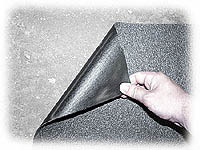 Made from needle punched polypropylene, these are the thickest pads available. Ideal for day to day industry use, shoreline clean up operations, rock clean ups and general spill containment. Each pad is capable of absorbing up to 1.4 litres of oil or fuel. Hazchem and General Purpose varieties are also available. Absorbs virtually all liquids both aggressive and non-aggressive. 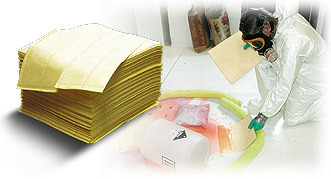 Yellow colored pads alert workers of potential danger. Made with smaller diameter fibers that allow for greater liquid retention & strength. 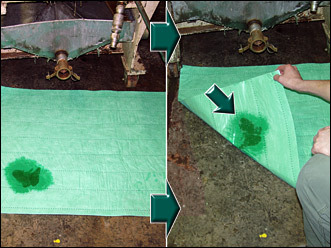 Use to absorb non-aggressive spills such as oils, coolants, solvents, and water. Use in, under, and around machinery and equipment for a clean workspace. Use to cover heavy-traffic aisle ways. 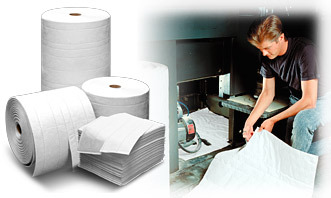 Designed for high-traffic areas and are extremely durable - they won't shred or tear. Leak proof backing traps liquids and protects flooring. 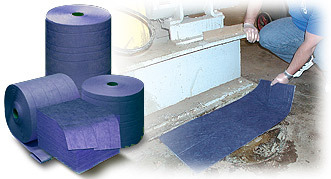 The poly backing is skid resistant, creating a safer workplace environment. 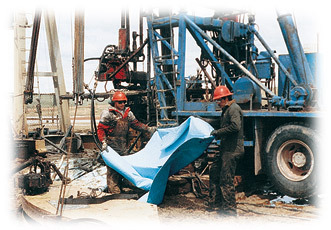 Our Oil Rig Rugs stand up well to vechile and operator traffic without disintegrating. 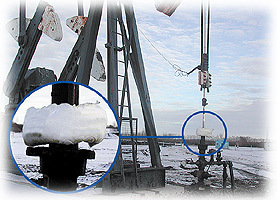 Pump-Jack Socks collect oil leaks and drips. Easy installation and easy removal.